I haven’t written to this blog in SOO long. A lot has changed in the meantime. I think the last time I wrote, I was still a GMail Site Reliability Engineer. Since then I’ve worked on abuse fighting for Google+ and Blogger and am now working on Google Maps. The other day I was trying to install ghc-core, which requires pcre. ghc-core-0.5.4 failed during the building phase. So I decided to completely uninstall macports. Fortunately, there is an alternative to macports: Homebrew. I migrated my linode box from an old version of Ubuntu to a new one. Unfortunately it was a bit of a pain as a plain migration did not work. So I had to install a new system and then reset up my blog and copy over the MySQL database. This is also the reason why this site was down for a day. I have also imported my old blogs from blogspot.com as I had planned to do once. You will find that for now they are completely illegible since unfortunately a lot of formatting was lost in the source code. I’ll try to fix those, time permitting. I think this is probably one of the best XKCD comics. 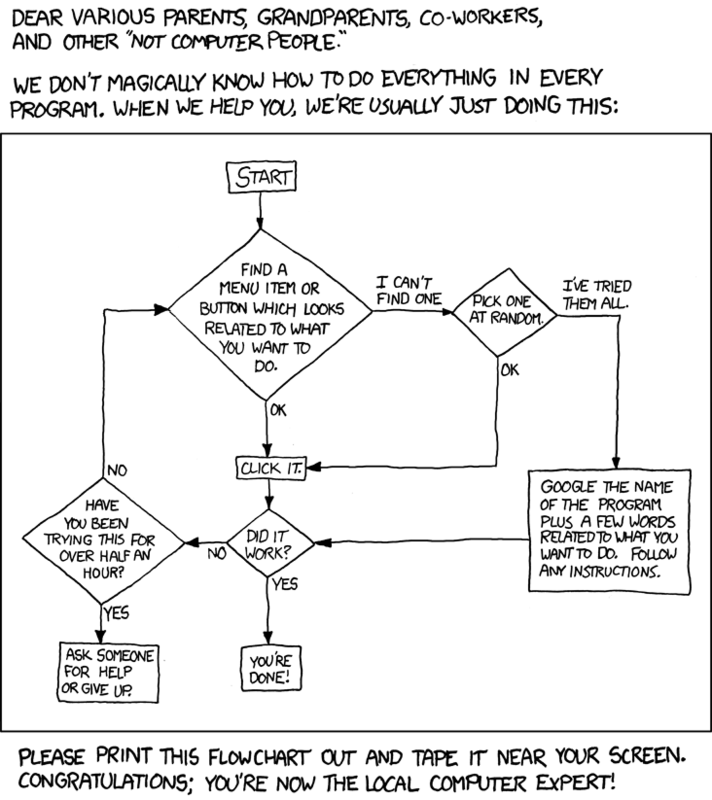 I wish I had had this in the past when people or family would ask me questions about computers (usually windows, being an avid Linux user). It seems I am still getting traffic on this blog. For those that know my prior two blogs, they will know this is not the first time that I moved blog. While the move from the first blog to the second (blogger to wordpress) was due to technical reasons, this time I am moving because I want to finally consolidate all my content in one place. I have had a virtual host for a while now, and never truly utilized it. I’ve been using linode and I have to say that I am very happy with the service and quality of the user-interface. Having recently bought my own domain (yes, the one at the top in your address bar), I decided to finally run my setup completely myself. So what am I running, and what do I want to write about? Well for that I have to take a step back. My last blog focused a lot on Haskell, for that is a language I am very passionate about. Unfortunately, I have had less and less time to actually devote to it. In the meantime, my eyes have opened to whole new worlds. While I have used linux for about 10 years now, it was always a means to an end. Finally stripped of my academic bubble I have come to appreciate the more technical aspects of it. It is therefore that I have started devouring a variety books on the topic. Additionally, since I was never formally a software engineer, having a background in electrical engineering, I decided to purchase a few books in the direction of being a better programmer. It is one thing to be confident of the fact that you can implement an efficient kernel algorithm in your language of choice. It is another entirely, to be able to tackle big projects and properly design software in layer. I am starting to realize that slowly. While reading the Passionate Programmer by Chad Fowler, I decided that I wanted to blog more on these types of topics. The combination of technical and psychological/sociological elements is always one that has fascinated me. So that is what I hope to achieve on this blog, a place to reflect on books such as the one above, a combination of software development and career development, speckled with little technical tidbits I learn along the way or that interest me. It is somewhat ironic that I am writing this now, when I am back in the city I used to study at, Leuven, to put the last dots on the ‘i’ of my Ph.D. thesis. Writing is not something that is my forte, though I admit it is mostly laziness. And as with everything, I hope to improve upon it. Perhaps it is that drive for constantly improving myself that makes me enjoy reading books like Chad Fowler’s. I have to say that starting this blog has definitely been rife of the Paradox of Choice. Questions such as what theme to use, whether to import the content of my old blog here. Simple questions are often the ones that take one the longest to answer, down to what name to give to a variable. Should I import my old content even though the topic was mostly directed towards one very specifical technical niche, namely Haskell. And for those wondering the original question, the answer is wordpress on lighttpd. I am already created a DNS entry for a wiki extension as well, where I can jot down interesting links I might want to discuss or unfinished content, however I am still deciding on what wiki software to use (Again, choices… Though I am heavily leaning towards MoinMoin). Finally, if anyone has an interesting suggestion for what to put on the main webpage (http://www.poucet.org), comments are always welcome. Discussion is the only way to learn new things, for otherwise we grow stale. Note to self: Don’t be afraid of writing your own opinions, instead of sticking to purely technical things. While at the haskell hackathon, I decided to work on adaptive containers, which is an initiative that had been started by Don Stewart, to get Data.Map and Data.IntMap more memory compact. Together with Nicolas Pouillard(ertai) we tackled this project. He worked on IntMap while I worked on Map. You can find the code at: http://patch-tag.com/repo/adaptive-containers. The main motivation for these adaptive containers it that it is impossible to flatten (or unpack) small data-types directly into the memory used by the data-constructor, so you end up with extra pointers for each value inside a container (specifically 2 pointers, 1 from the container to the data-type, and then one from the data-type to the unboxed one). Update: A video was posted where Don Stewart presents the basic concepts and where I briefly present the associative adaptive containers mentioned in this article. Notice that the case for two tree deconstruction is completely defined based on single tree deconstruction, so you only need to worry about tip, unsafeBin and mapMap. Also note that this representation assumes you will have an implementation that is similar to the original one. The reason for this is that I’ve read in the past that flattening 3 tree nodes into one can give you very good cache locality. While you are recreating nodes on deconstruction, these will be cache local anyways, so it should not be that expensive to access the data in these. To see this in action (apologies about the long data-constructors), the following image is a representation of fromList $ zip [1..100] [1..100]. While the image is not fully clear, it is clear that the number of nodes used to represent this is much smaller.